That Two Paddocks should be in existence seems to have been foretold decades earlier by Sam Neill’s father. Driving through Central Otago in the South Island, Neill Senior commented that it made no sense wine wasn’t being grown in this region of New Zealand given the way it reminded him of Italy, where he had previously spent time as part of the British Army. Prior to wine, Central Otago was famous for the luscious stone fruit grown in the region. With my own family history in Central, childhood memories of this area are of the wonderful cherries, apricots and peaches we inhaled each Christmas rather than the delicious wines now produced. The international reputation of Central Otago as a wine-growing region is relatively recent. So in 1993 when Two Paddocks came into existence, it was to join only a very small number of wineries in the area at that time. A site in Gibbston Valley was selected and planting began with 2-3 hectares of Pinot Noir. Over time this Gibbston Valley vineyard, The First Paddock vineyard, has grown to 5 hectres, with the oldest vines being planted on their own roots – phylloxera thankfully having not made an appearance in Central. When a good enough vintage occurs in Gibbston Valley, an area once maligned for its potential to grow Pinot Noir, a single vineyard wine is produced – Two Paddocks The First Paddock Pinot Noir. At our lunch we were fortunate enough to taste the 2010 First Paddock alongside the other single vineyard wine, Two Paddocks The Last Chance Pinot Noir. I particularly enjoyed this comparison. Not only are the two vineyards located at opposite ends of Central Otago (First Paddock in Gibbston Valley, Last Chance in Earnscleugh Valley) but they also are completely different expressions of Pinot Noir. The First Paddock showed an all-together more delicate style when compared with The Last Chance Paddock. Musky floral notes, raspberries and red cherries came through on the nose and the palate. Fine grained tannins and high acidity made this wine an excellent match with the richness of the char-grilled Japanese beef short rib served as part of a grill selection at Gonpachi restaurant. Located in southern most region of Central Otago, Earnscleugh, The Last Chance Pinot Noir was the more assertive of the two wines. Looking at my notes I see the word “structure” underlined. Compared to the delicate First Paddock, there is more oomph to this wine. Spicy and smoky notes in the wine were complemented by another selection from the grill – the bacon wrapped asparagus. This was my favourite wine of the tasting, the red and black fruits being particularly well balanced by spicy notes – perhaps an unexpected benefit of the wild thyme that grows around these vines? Having a clear distain for corks, sparkling wine and the use of the word “passion” when it comes to wine making, it with tongue in cheek I describe Sam as a passionate advocate for “the greatest underrated grape in the word” – Riesling. 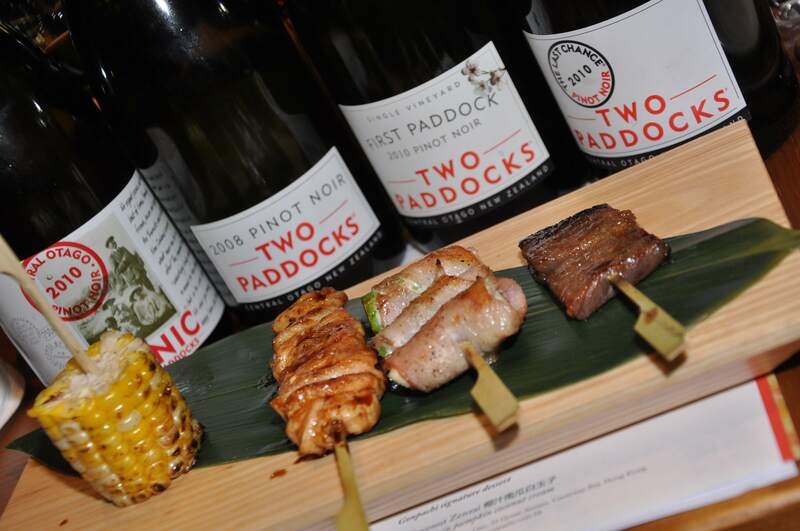 Two Paddocks makes two Rieslings – the Two Paddocks Riesling and the Picnic Riesling. The Picnic Riesling is part of the entry-level series where the style of wine and the price point make for easy consumption. In a nod to memories of family picnics and the Neill family history, the labels depict Sam’s wine merchant grandfather (Picnic Riesling) and other members of his family including his “small but dangerous” grandmother (Picnic Pinot Noir) – a theme continuing to the present day perhaps, with Sam’s “small but very powerful and very scary” wife being the inspiration for the Riesling production. 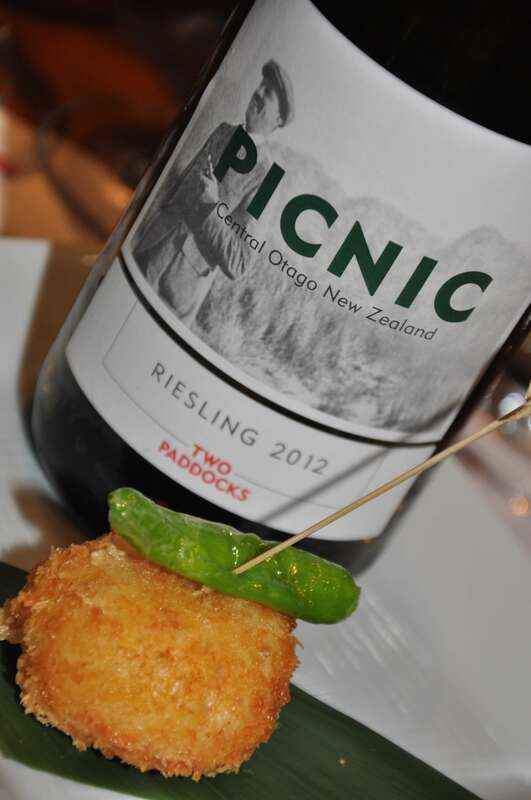 An appetiser of a fresh crab croquette was the match for the 2013 Picnic Riesling, which is made in an off dry style having 10g of residual sugar, i.e. the yeast did not convert all the sugar in the grape juice to alcohol leaving behind 10 grams of sugar per litre. This is a luscious Riesling that starts with ripe stone fruit and delicate white flowers before moving on to the mouth-watering acidity of citrus fruits – the perfect accompaniment for any picnic! Two Paddocks, as everyone knows is a winery owned by a Hollywood star and Kiwi icon, but more importantly it is producing wine that ensures Central Otago’s reputation as a wine growing region of international stature is firmly established.